At first glance, TNKK seems like a cute and different kind of story. The female lead, Shizuku Mizutani, is top of her class but not without a price. She's cold and emotionless, only caring about studying and becoming successful, very much the anti-shoujo stereotype of being obsessed with love. She meets Haru, an intimidating boy with natural smarts that outmatch hers, a vivid outlook on life and an extremely wild, aggressive streak. The two are natural opposites - id and ego - who are destined to fall in love and grow together, to better themselves, right? TNKK falls short of being a slice-of-life type of romcom, with half-hearted life lessons and story arcs that don't lead to actual character growth. Beyond the first episode or two, the story isn't exactly "touching" either. There is this back-and-forth love story for the majority of the 13-episode anime which was extremely tiresome all too soon. Characters are introduced, such as 3rd party love interests or the main characters' relatives, that are irrelevant to the plot, get no character depth, or are rarely seen or heard from even though they are engaging and exciting. No plot lines get resolved and there is next to no character development. If anything, Haru and Shizuku regress into their 1-dimensional roles and become side-characters to others, such as Yamaken or Natsume (who, unfortunately, do not get their stories resolved either). It ends up being a chore to care about the two main characters. All in all, I just wouldn't recommend this series unless you REALLY have nothing better to watch. It has a few cute or sweet moments, but don't expect another Toradora or Chuunibyou. Having not read the manga, I can't be sure as to how well it goes along, but as a stand-alone anime, 13 episodes have left me wondering why I even bothered watching this show. And the fact that it can't hold its own, to me, is a mark of a bad show. Too many times have I seen the redundant case in anime where a show will conclude at what feels like the midpoint of the series. Although providing quality artwork, animation, and satiating my thirst for lighthearted romantic-comedy, Tonari no Kaibutsu-kun (My Little Monster) falls victim under this unfortunate plague. The plot of My Little Monster resides mainly in the perspective of the two main characters, Shizuku and Haru; both are social outcasts and have no friends at the beginning of the series due to their own respective personalities not meeting the standards of the social norm. They are both very weird characters, but maybe that's why they were so entertaining to watch. I enjoyed the first half of My Little Monster a little more than the second because the characters were so forward with their emotions in the beginning and they really did voice what was on their mind unlike many other extremely passive rom-coms. The second half seemed to be a bit lacking for me in terms of development overall. The chemistry between the two main characters would be best described with a quote many of us have probably heard before in our lifetime, "Opposites attract." Shizuku is a study enthusiast whose main goal is to get good grades, while Haru is a semi-delinquent that does whatever he thinks is entertaining and often is seen getting into fights. Both become each other's first real friend. As they get to know each other Shizuku and Haru slowly begin to understand themselves as individuals and what they want from themselves and each other. They are able to make friends and assemble their own group of oddballs to form their own little niche. The core of the group consists of Shizuku, Haru, Natsume, and Sasahara and I liked all of them collectively. Since we know Shizuku and Haru are the romantic duo, where does that leave Natsume and Sasahara? 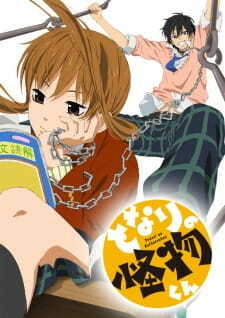 Natsume is typically seen 'third-wheeling' with Shizuku and Haru and often tags along with them to go places because she doesn't have friends either; she isn't very smart, is athletic, and is quite attractive to many guys in the show, leading her to be shunned by almost every other girl as a result. Sasahara is a baseball player that pops in every now and again, and though he's part of the core group he isn't there as much as Natsume is due to being in baseball and having other friends. He seems to be the most normal of the group. I loved this group of weirdos because they each brought something interesting to the table and truly delivered on the comedy portion of the rom-com. There are many times in My Little Monster that you will sadly forget the show is in fact a 'romantic' comedy since the romantic bits of the show are extremely lacking. In fact, I would go so far as to deem it underwhelming. It was such a nice change up for the main characters to admit they were in love with each other within the first three episodes that I developed higher expectations thinking the series would be one of the best rom-coms around. Unfortunately, the romantic progress seemed to work backwards and the main characters went from knowing they were in love to becoming extremely passive, both unsure what they wanted from the relationship. Though this saddened me greatly, it does not ruin the show in the slightest. The artwork/animation and sound were spot on. I enjoyed everything the show had to offer for this portion. The artwork was unique and refreshing, there was clean animation, and the OP/ED were actually pretty good. There was the tingle of piano at dramatic moments, and upbeat silly music when things were getting fun, I couldn't ask for more. I also enjoyed the dialogue of My Little Monster very much. The subtle comments and word choices used really made for some quality comedic entertainment. Last but not least, the ending. As I mentioned in my introduction, the show seems to end at what seems to the the mid point in the series; it feels like it got halfway through a 24 episode run and got scrapped. A second season would do this series so much justice, but alas it may never come. Overall, if you plan to watch My Little Monster, don't have any expectations of a grand love story because there isn't one. As a romantic-comedy there should be a balance between romance and comedy, but this one leans more on the comedic side than the romantic one. It is a very feel good anime, and if you can ignore the lack of romantic development the show excels in giving you laughs and will leave you feeling genuinely happy. So while scrolling through Netflix during the ungodly hours of the early morning, I came across Tonari no Kaibutsu-Kun. The premise seemed interesting; a studious, no nonsense, anti-social girl named Shizuku finds a friend in a hostile boy Haru. While not an entirely unique story nor complex, I still found it entertaining. I will say that I almost clicked out on the first episode due to pacing issues. However, I'm glad I didn't, because it turned out to be quite enjoyable. The said pacing issues were non-existent due to a scene that happens at the end of the first episode that surprised and intrigued me, but I won't spoil it here. It was listed under the comedy section, so I figured I'd give it a shot, to break it up from all the serious anime I've been watching lately.Needless to say, the comedy did not disappoint. On multiple occasions I found myself laughing out loud, I even almost squirted milk up my nose. The art while nice and clean, is nothing special, however there are aspects and moments that are really beautiful. The animation during any of the sunset scenes are absolutely stunning. In the second episode I believe it's raining and the shot holds on the rain and the puddle. It looked incredibly realistic. Though not as stunning as others, I also love the eye designs, especially Shizuku and Haru's. The opening song is pretty average for the Shouju genre (or at least the ones I've seen), and I admittedly don't think that much for the ending song either. I will say I adore the soundtrack though, it's really mellow, and I could probably listen to it whilst going to sleep. The characters, I found were all very unique and distinct from one another, yet still maintain their personality as they developed. That being said, I feel as if it could have used a few more episodes to further develop the characters, as it ended fairly ambiguously in regards to said characters. When I started this early this morning, (like at one or two am) I didn't want to stop. But after watching four episodes I figured I should go to sleep. The first thing I did when I woke up this morning, you ask? I watched more. I definitely had me hooked, and I really wanted to know what was going to happen. I was a touch disappointed at the ending however the journey paid off, more so than the destination. This anime is really good, is not the typical romance comedy and the main character is great, it was really one of the few interesting characters i have seen in a while and i realated to him, well most of him, he is almost like a sociopath. The story could seem generic, boy meets girl, he falls for her, they start a romance, well is nothing like that, is about this boy Haru Yoshida who doesn't like to go to school because he can't make friends and one day his classmate Shizuku is sent to take the homework to him, they met and she starts to like him and even feeling love but he rejects her because in that moment he didn't saw her like that, and as the episodes goes she lost her interest on him but he started to love her, she rejects him, she finds out that he is the best student of the school and start to study to beat him, and she starts to be indiferent with him, like if he was nothing to her, but Haru still loves her and is really jealous to the point he could be considered a Yandere, and both of them are a rollercoaster of indecisions and this can be annoying as f**k, at some point where they never get nowhere with their relation, i screamed WHYYYY! for f**k sake and the ending was just FUUUUU*K! it was so freaking open and it was hinted that there was going to be a 2nd season, if there was a 2nd this could have been great, like a build up for better things on the 2nd season, you will be mad. They both were great, there are some flaws but nothing big, the voice acting choise was great, i can't imagine the characters with other voices and Shizuku's voice made her really likeable. They were very good for the most part, the thing is they weren't very well developed and Shizuku and Haru relationship was desperating, and we don't know the backround of anyone and i wanted to see why Haru hates his brother, and why his brother hated Haru when they were kids. I enjoyed this so much but there were times that i was really mad and i wanted to rage lol, didn't enjoyed the end, i felt empty after that, even having watched the OVA, it was good but they fu**ed up with that stupid ending too.